Today I travel to Tropical World, Donegal’s popular Butterfly House and Mini Zoo. Undeterred by the rain, I make my way on the N13 road to Letterkenny/Ramelton. Along the way expect to see wonderful historical and archaeological gems. Notably the ancient fort of An Grianan which stands guard over the landscape and Burt Castle which rests on top of the appropriately called Castle Hill. With a final turn off from N13 onto R245 I arrive at my destination. On arrival I notice a florist & gift shop, large garden centre and restaurant. A fan of flowers, my first stop is the vibrant and spacious florist which offers a wide selection of flowers to cater for any occasion. 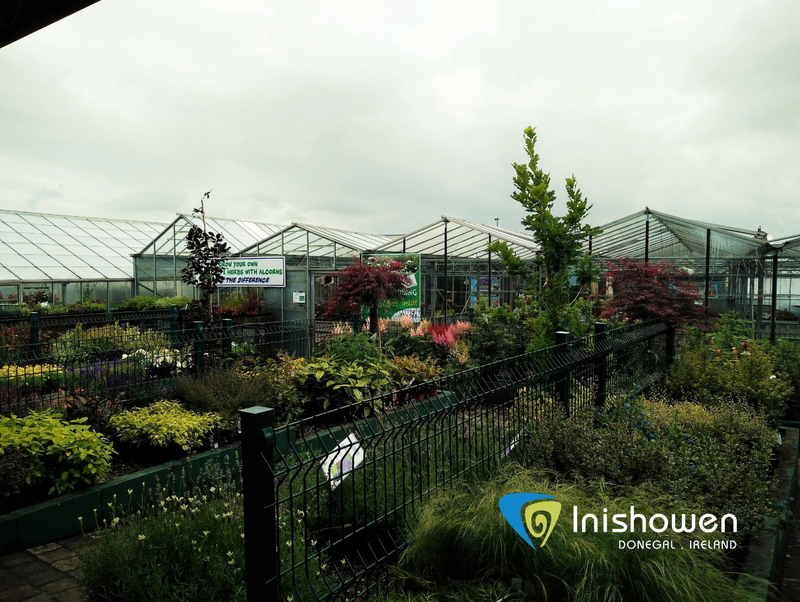 Next stop is the garden centre, which can only be described as every garden enthusiasts dream. With knowledgeable staff on hand, you will leave the centre with all the information and products you need. What struck me was the space and freedom to wonder around comfortably. Care has been taken to ensure the grounds and associated buildings are wheelchair accessible. Following a warm welcome from John Alcorn, joint director of the property, I am introduced to his son Lewis Alcorn, who has been working at Tropical World since it was established in 2011. 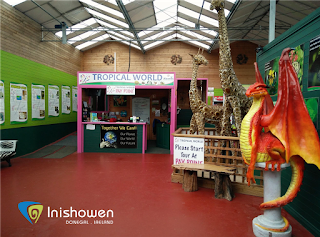 There is a great atmosphere at Tropical world "which is a family run business". From the garden centre we make our way to the reception area, pictured above, which is bright, spacious and inviting. Information panels occupy each wall and engage the reader with fun and accessible text for all age groups. Spotting the large Dino Den sign, I am told is the "new addition to Tropical World in 2015", I go to explore and feel like I am on the set of Jurassic Park! You will see why the Dino Den has become a favourite with many visitors. 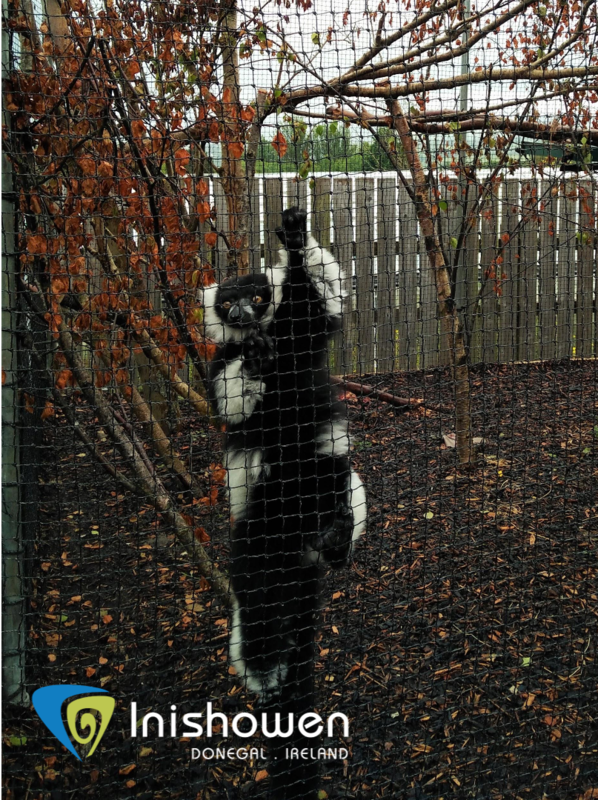 Lewis states that the emphasis at Tropical world is to ensure “the visitor has fun but learns something along the way”. 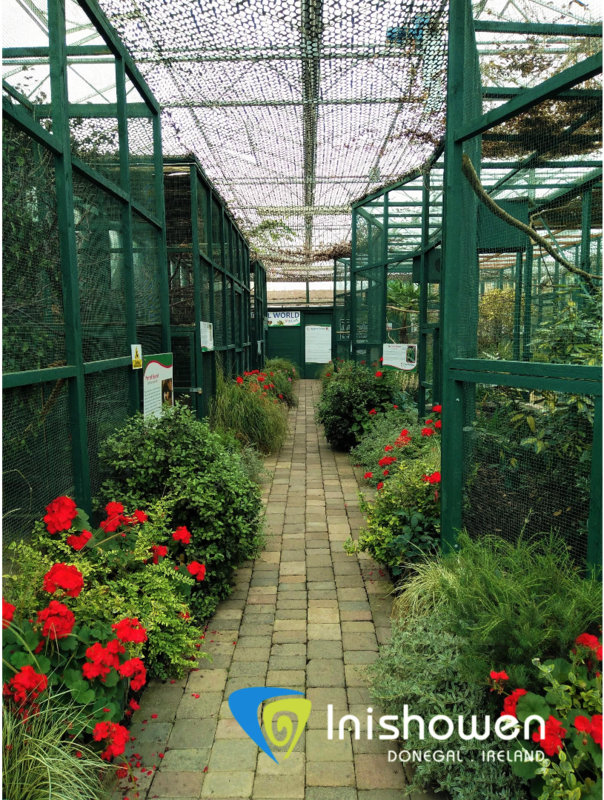 A personal favourite was my next stop, the Butterfly room pictured above. Pulling back the black protective curtains I enter a simulated rainforest environment. Hot, humid and misty I feel like I’m in a totally different location. 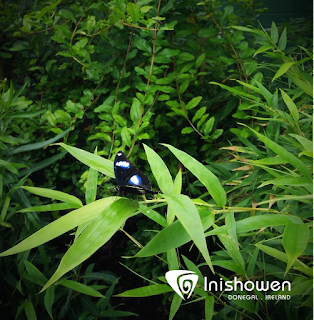 Butterflies fly overhead completely undeterred by my presence, offering you the opportunity to get up close to these beautiful creatures. Although the delicate butterfly has a short life span of three weeks, they are well cared for in this unique environment. In a container, you can view future butterflies in crystallised form, providing the opportunity to view different developmental stages. I soon realise why “The Butterfly room remains a consistent favourite”. 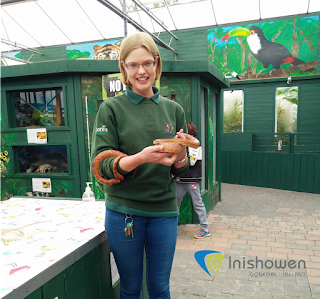 Mammals, Exotic Birds, Reptiles and Creepy Crawlies! The next area leads to the exotic birds section, pictured above. The range of colour is striking, as I view species from Africa, Australia and Asia. The new, extended free flight Avery provides an opportunity to see the birds stretch their wings and take flight. I draw my attention away from the exotic display and slowly make my way to investigate the reptile and creepy crawlies section where you will learn about the collection of snakes, lizards and hair raising tarantulas. Mammals on display include meerkets, squirrels, yellow mongoose, ring tailed lemurs from Madagascar and short clawed otters. 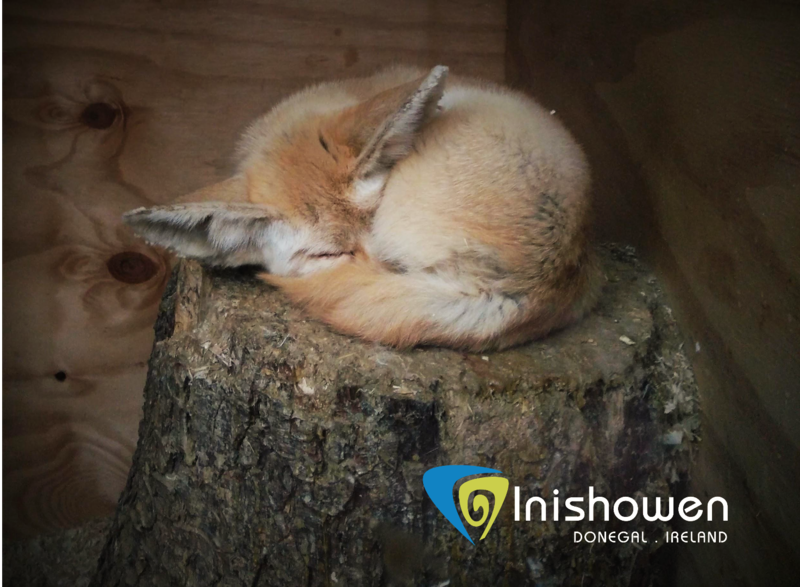 One mammal in particular that grabbed my attention was the adorable Fennec Fox. 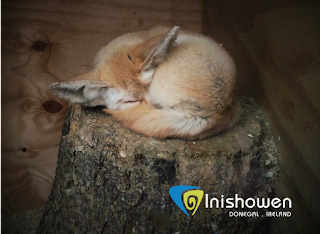 Fennec is a small nocturnal fox from the Sahara in North Africa. As you can see above, he is curled up and having a nice snooze. Just when I think I have seen it all, I follow directions outside to a large area called the Hazel Hill Habitats, opened in March 2016. 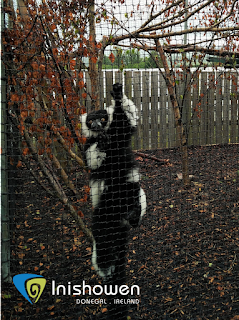 Outside there is a series of enclosures, which showcase many types of wildlife, including a favourite with staff; Tetly the Black and White ruffled lemur, pictured above. 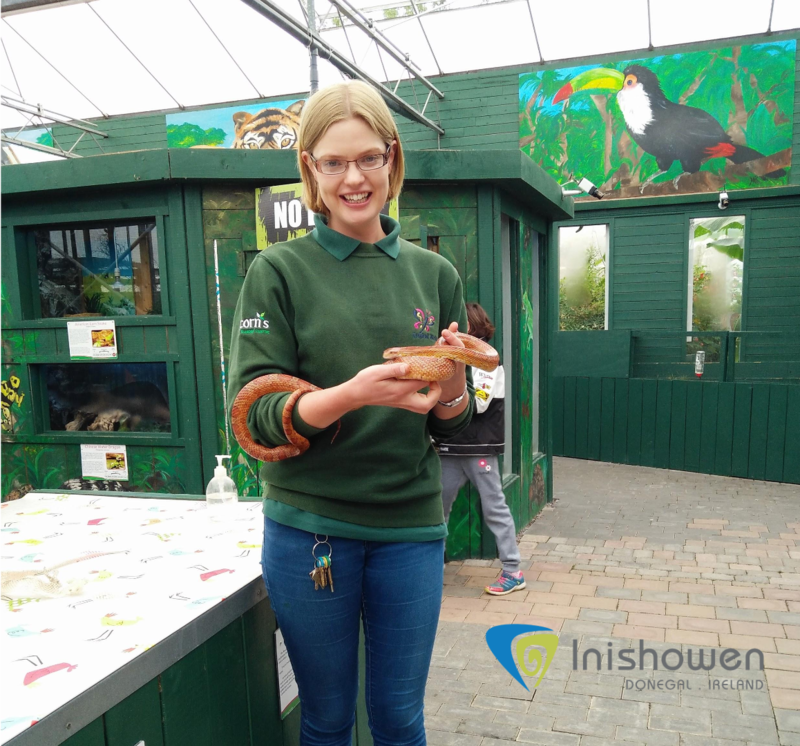 Shortly after completing a degree in Bio Science in Letterkenny I.T, Tanya “got the job by chance”, “Clive Alcorn, director and founder of Tropical World, approached Tanya about an idea "to have a butterfly farm" and if she "would like to come on board”. Tanya took the opportunity and over six years of hard work followed. In that time Tanya “completed a Diploma in Management of Zoo and Aquarian animals, followed by training in Stradford-Upon-Avon Butterfly Zoo, birds section in Edinburgh Zoo and Belfast Zoo”. In 2012 Tropical World was granted a zoo licence which “meant so much for the property and staff as they could now expand” and in 2013, became a member of BIAZA, British and Irish Association of Zoos and Aquariums. 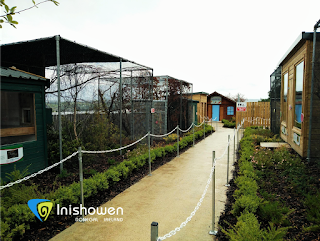 Each year director Clive Alcorn and the team strive to have a new addition or feature, like the Dino Den or Hazel Hills Habitat pictured above, to join there already extensive and impressive butterfly room and mini zoo. A lot of people remark that they “didn’t realise it was so big and left with gaining more than what they expected”. I totally agree Tropical World and adjoining Alcorns Florist and Garden Centre have a package that will satisfy the needs of any visitor or local who wants to drop by. Aside from the sheer fun of the environment itself, I left Tropical World with an appreciation of and awareness of the rich habitats and environments that wildlife come from and need in order to survive. Stay posted for our next blog where Tanya tells us more animal story's and what a day is like as a Head Keeper at Tropical World.